FoamFix is a mod designed to optimize post-1.7.10 modded Minecraft using simple, targeted optimizations. Observations show that Java heap usage (measured using VisualVM on the main menu) can drop by as much as 50%! Q: I'm having performance issues, and removing FoamFix fixes them! A: Make sure you have updated to the latest version. It is impossible for me to test FoamFix on the thousands of computer hardware configurations out there with my own resources, and sometimes issues specific to some of them can occur. If you have updated to the latest version and are still experiencing issues, contact me! Q: Where did the Lawful Edition go? A: The recommended way now is to set "enableCoremod" to false in an Anarchy version. It will still show a coremod is present, but the coremod will not actually modify any game logic. If you really need Lawful specifically, the builds still exist here. Q: Can I run FoamFix on the server/client side if it's not present on the client/server side? Q: Can I mix versions/editions of FoamFix? Q: Can you backport FoamFix to 1.7.10? A: No. FoamFix primarily targets 1.8+ modded Minecraft. I recommend this guide for users of modded 1.7.10 Minecraft. Q: Can you make FoamFix for vanilla? A: Almost all of FoamFix focuses on optimizing memory usage patterns common in Forge and mods. Porting it to vanilla would have very few benefits, as vanilla by itself is more efficient than even Forge+FoamFix. Q: Can you run FoamFix in a development environment? A: Yes, but you must manually deobfuscate it with BON2 or a similar tool. Please try to reproduce the bug without FoamFix first - if it is still present without FoamFix, it is most likely not a FoamFix issue. Please ONLY report them here! This helps me keep track of existing issues. In particular, please do not report them to the other mod developers! If I get to the conclusion that the issue is caused by a different mod, I'll do my best to contact the other author myself and discuss the fix with them; however, unnecessary bug reports are a bit of a nuisance. Install BetterFPS - it optimizes other areas of Minecraft not targetted by FoamFix. If you're experiencing "ghost chunk loading"-related lag (a noticeable lag spike every ~30 seconds), a way to partially work around the problem is to increase the value of dormantChunkCacheSize in forgeChunkLoading.cfg. For some GPU/driver configurations, disabling mipmaps (setting Mipmap Levels to 0) will boost FPS considerably. This is due to lag caused by animated texture updates being much higher with increasing amounts of textures to update, which scales linearly with the amount of mipmap levels. Since 0.6.3, FoamFix sets the setting as default on new instances. On dedicated servers, setting max-tick-time=0 can solve crashes related to "java.lang.Error: Watching server". Still looking into why this happens! java.lang.NoSuchMethodError: net.minecraftforge.common.model.TRSRTransformation.isIdentity()Z on FoamFix 0.9.6+ - Update Forge to the latest recommended version, or downgrade FoamFix to 0.9.5.
java.lang.IllegalArgumentException: Cannot set property [...], it is not an allowed value - The codepath causing this error mimics vanilla behaviour very closely, and should cause the same crash without FoamFix. Make sure it cannot be reproduced without FoamFix. If you're using SpongeForge alongside FoamFix (keep in mind that I do not support it), a common crash related to MixinMutableBlockPos can be fixed by disabling coremod.optimizedBlockPos in config/foamfix.cfg. Please only use the GitHub issue tracker for bug reports. Makes it easier to keep track of them. Please note that "not supported" does not mean "won't work at all" - rather, it means "things can break and I might be unable to help you for various reasons". Be careful! BetterFPS. I recommend using BetterFPS in particular if your CPU is low on L2/L3 cache. VanillaFix. It is rather invasive (which scares me a little), but also effective. If you need it, you can probably use it. FastCraft 2. The licensing is very strict and debugging impossible without relying on the developer as an oracle. NotEnoughIDs. Not maintained since September 2017. OptiFine. The licensing is very strict and debugging impossible without relying on the developer as an oracle. If you'd like to support future mod development from me, please consider donating via the link above or through Patreon. Any update on 1.13.2 for Forge? Mods are starting to move away from Rift, and I'd miss FoamFix if I switched over. I myself would like a Forge version of 1.13 FoamFix as well, Rift's kinda drifting away. Are there any rough guidelines for when Optifine or FoamFix are better? As in mod quantity, mod's weight on the game, etc? Since thewy're both compatible with VanillaFix AND BetterFps I will be playing either optifine or FoamFix with those two alltogether. Hey, I was wondering what would be better, Optifine, or FoamFix? Does it depend on the number of mods? I am currently trying to find as many mods as I can (that I like) and so far I've gotten 120+ mods. Obviously, with so many mods, I am bound to overwork my poor laptop. I've stuck with Optifine for quite a while, ever since someone first told me about it when I found Minecraft Java had a worse FPS than the Xbox. However, I am willing to give it up if it means getting rid of my performance issues. While typing this, I found VanillaFix, which sounds incredibly promising, would this eliminate the need for Optifine when it comes to modded Minecraft? I think that's all I have for now. If you have any questions for me, let me know. Thank you for reading this, it means a lot to me, so have a cookie! Just try thing out man. All I can say is that I know that VanillaFix should be able to run alongside optifine. Aswell as another mod called BetterFps. Havent tried any of them besides optifine, just giving you options, try it and combinations with them out. *Edit: I've just read that this one here is also able to work with VanillaFix and BetterFps, so I would assume, with a bit of trying, it MIGHT be possible to have all four performance-enhancing mods in. 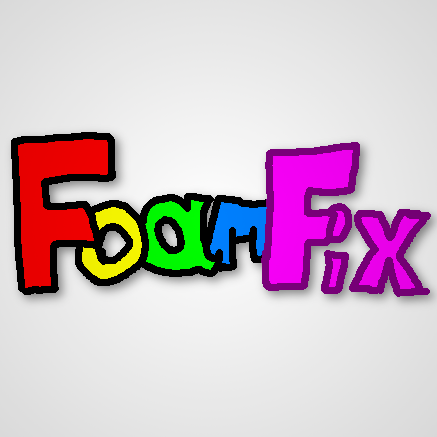 I'm wondering this, Since there is no Config file for the Fabric 1.14 FoamFix. What changes does the 1.14 FoamFix make when put into a dedicated server? I remember the 1.12.2 version had multiple client/server options but surely the 1.14 version isn't that far along yet, right? Just some minor memory optimizations. One of them applies to all sides; the other only to the client. Alrighty, thanks for clearing that up for me. How come Foamfix causes so much lag? The memory is fine, but it causes everything I use it with to drop to 1 fps, maybe 2, until I disable all texture animations. enableCoremod is not an option in the config in version 0.10.3. Well, I'm not precisely on topic here, but you are clever people, so perhaps. 1.12.2 MC, 14.23.5.2815 Forge, latest FoamFix, and mods. We encountered a problem which was referenced in 2013, after some updates with our modpack, and having 2-3 sudden, unintentional poweroffs on the linux machine which runs our server. Before that, all dimensions which had no players inside, quickly unloaded from the server, and all was well. I wonder if the level data was perhaps damaged by the power-offs? The symptom is that after a time the server will load, then unload periodically the Thaumcraft magical Auras of chunks in the Twilight dimension, which is the starter dim, at #-7 - even if nobody is in it. That lags the server immensely. Can you divine some answer from this, or from the intestines of a freshly sacrificed goat, please? I'd put my bet on ghost chunkloading. I'd bet something loads those chunks (perhaps a per-tick handler) without actually marking them as forcibly chunkloaded - this causes the server to automatically unload them after 30 seconds no matter what, unless a player is in the area or if they're part of spawn chunks. If the per-tick handler requests them next tick, then you've just seen a save and a load in the span of what should be ~100ms at worst - but at this scale it can easily take a few seconds. The settings below are a valid postponement for this, as such. Would this run well with Optifine?